Those who maintain that chess doesn’t fit well on TV have probably never watched the Leon Chess Masters. The players’ faces reflecting a huge tension on time trouble attract even those who know nothing about chess. The Castilla y Leon TV catches the idea: it will produce a daily special program during the tournament (June, 5-7th) and broadcast the end of every game live. “Rapid chess implies more mistakes and more stress on the players than classical, but I understand it’s a lot of fun for the public. Besides that, the Leon tournament is very strong and well organized. All together, the balance is very positive”, said the Norwegian Magnus Carlsen, the Mozart of chess, in a video recorded interview, shown during the Ciudad de Leon Chess Masters presentation at the Marca newspaper headquarters in Madrid. The Ukrainian Vassily Ivanchuk used similar terms in his good Spanish, wearing his favourite Real Madrid tracksuit. The Chinese Wang Yue, new at the top, stressed: “Both Kasparov and Karpov played in Leon, which is very significant about how important this tournament is”. The participant’s quartet will be completed by the Russian Alexander Morozevich. The big absent this year will be the World Champion Viswanathan Anand, seven times winner in Leon, who also recorded some nice words about this tournament. Left to right, standing: Marcelino Sion (organizer), Javier Martinez (Alsa), Arturo Bascones (Diputación), GM Miguel Illescas (commentator), Javier Ochoa de Echagüen (FEDA president), Alejandro Vaquera (University) and Avelino Hernandez (Cajaduero). 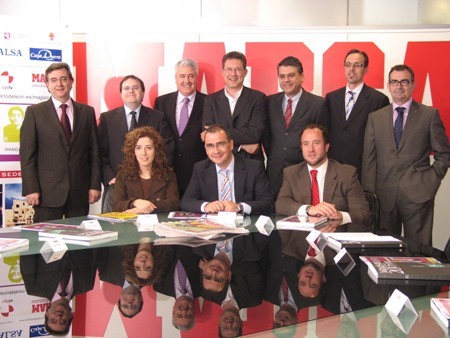 Left to right (seated): Natalia Rodriguez Picallo (City Hall, Sports Deputy Mayor), Juan Ignacio Gallardo (Marca newspaper Deputy Editor) and Miguel Ignacio Gonzalez (Junta de Castilla y Leon, Sports General Director). In order to fit well on TV, chess has to be transformed into a good show, and not only by speeding the game. Remote control cameras at the stage (and even on the playing table), electronic boards, giant screens, GM commentary for the spectators’ headphones and, not less important, a nice and suitable venue. The Junta de Castilla y Leon (regional government) building’s assembly hall has been an excellent one for many years, but we now have a better one: the Auditorium, equipped with the latest technology. The Castilla y Leon TV will rely on four professional and experienced chess commentators for its broadcasting: GM Miguel Illescas, Jesus Boyero, Miguel Angel Nepomuceno and the writer of these lines. That company main executives know the very successful background to chess on TV in Spain, always produced by Televisión Española, the public channel: 50 daily programs during the Kasparov-Karpov World Championship, Seville 87; the very exciting last game of that match was broadcasted live, with 13 million spectators (official statistics); and the 39 programs of the weekly En Jaque, from September 1990 to June 1991, including two games Kasparov vs. spectators. The presentation in Madrid was also good to double check how the traditional sponsors are still supporting this renowned tournament, despite the world’s economic crisis. The public sponsors (City Hall, Diputacion [province government], University and Junta de Castilla y Leon) and the private ones (Alsa, Cajaduero, MIC Publishing House, S3P and others) are betting for chess as a very useful social tool, but also as a good show which can fit well on TV.